Brangwyn in Horsham has just opened at the Horsham Museum & Art Gallery and it is an exceptional exhibition. Frank Brangwyn (1867-1956) was a significant and influential artist in the late 19th and early 20th centuries though he did not fit comfortably with the English art establishment. There is a growing revival of interest in his work. This timely exhibition centres on a selection of cartoons produced by Brangwyn for Christ’s Hospital which have not been seen by the public since they were last exhibited in London in 1924. As a charitable school Christ’s Hospital has to direct all its resources to offering an independent education of the highest calibre to children with academic potential from all walks of life. Consequently it is a child’s ability and potential to benefit from a Christ’s Hospital education that determines their selection not their ability to pay. Therefore the cartoons have only recently been able to be conserved thanks to the support of the Horsham District Council’s 2019 Year of Culture fund, providing an important legacy to this year-long celebration of heritage and culture. It is wonderful to see the cartoons by Brangwyn so beautifully conserved. They are squared up to enable them to be enlarged and transferred onto the series of panels he painted for the Christ’s Hospital chapel. The panels follow a procession from the Acts of the Apostles to the conversion of Britain to Christianity and the mission of the Church of England. 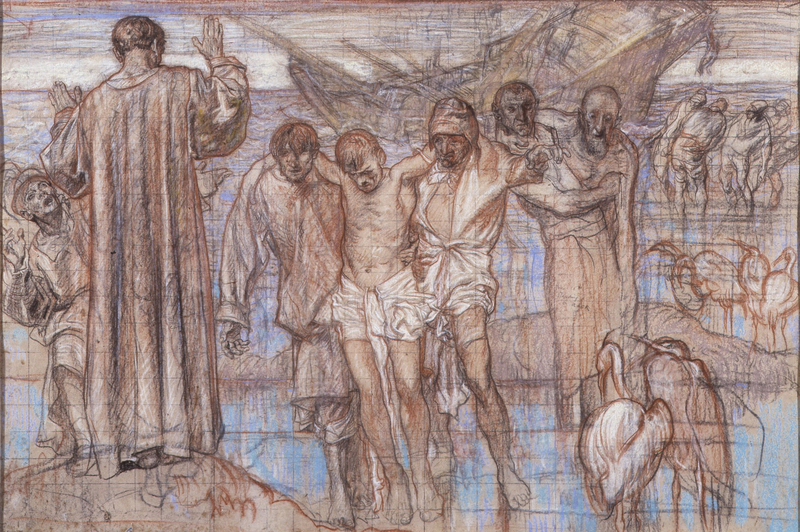 The cartoon seen here is the study for the panel ‘St Paul Shipwrecked’. Paul travelled to Rome to face judgement after the disciple Ananias had healed his sight. St Paul is depicted with his hands raised in blessing giving thanks to God after they were delivered from the shipwreck – as it says in the Acts of the Apostles ‘And so it came to pass that all escaped safe to land’. The panels are important not just as fine examples of Brangwyn’s work, but also because they form part of a common narrative amongst modern British artists at the time who sought to reaffirm what it is to be British and to redeem our nation from the experience of the first industrialized world war. The panels are honest about the costs of standing up for righteousness with illustrations of Christian martyrs, many associated with Britain. But they are also hopeful clearly depicting the triumph of good over evil. 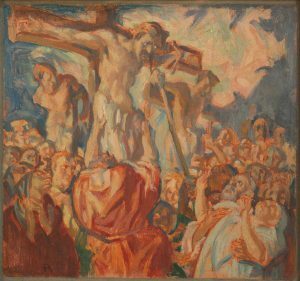 Appropriately two pencil drawings by Brangwyn from Horsham Museum & Art Gallery’s own collection are on show for the first time together with other works by the artist loaned from private collections including the painterly crucifixion seen here and examples of his ceramics. The exhibition, Brangwyn in Horsham, leads a growing renaissance of interest in this significant artist. It runs at the Horsham Museum & Art Gallery, The Causeway, Horsham, RH12 1HE, until the 23rd March 2019 providing a rare opportunity to see these exceptional works and admission is free. The exhibition will then move to Christ’s Hospital Museum. For more information go to www.horshammuseum.org.